Books go anywhere! And it's wonderful to find new ones, and share favorite ones. Since opening our own Little Free Library, we are ever more aware of discovering books, sharing books, and finding other Little Free Libraries. Of course, you can't judge a book, or a tiny library, by its cover. 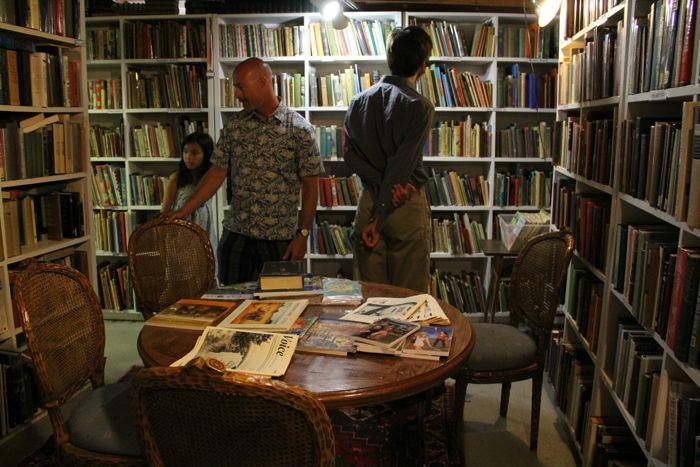 We discovered this charming tiny library, in front of The Foundry Books is not for books, but for haikus! We could have stayed in here for hours. I fell in love with their maps, and the cool, quiet aisles and aisles of books. 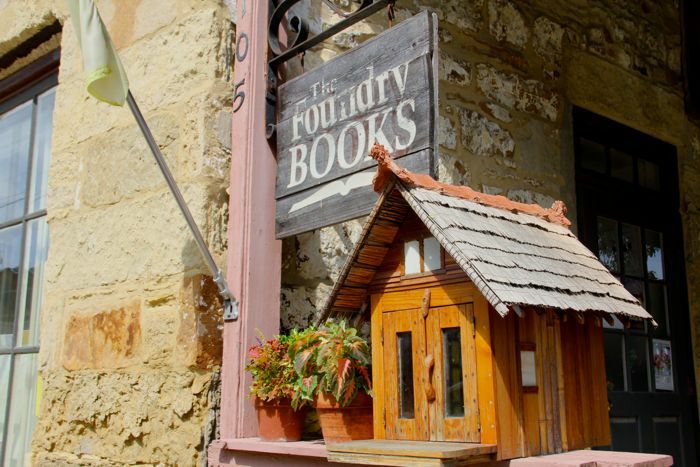 One of the specialties of The Foundry Books, in Mineral Point, Wisconsin, is haiku, and they sell haiku books, and journals. 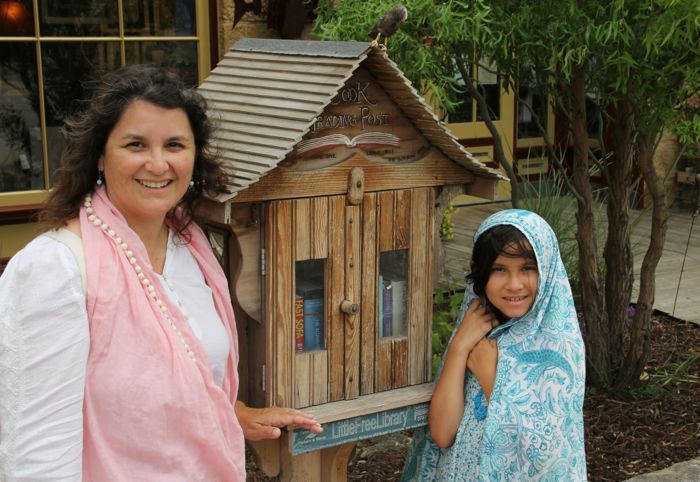 In front of the Longbranch Gallery, Little Free Library #737, Mineral Point, Wisconsin, is waiting for your patronage. We saw Little Free Library #734, in Mineral Point, too. It's a real darling... "A Fairy Library For Kids." Inside, it's been lovingly decorated with children's drawings of fairies! 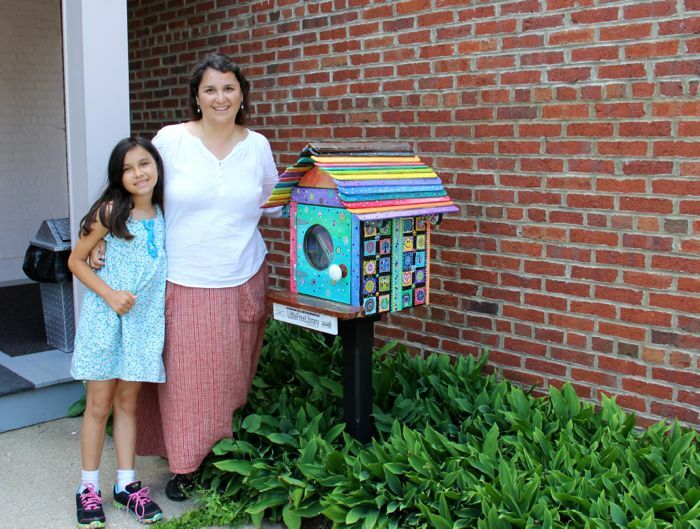 Outside High Street Sweets, in Mineral Point, you will find Little Free Library #7754. It looks as sweet as a candy rainbow. We found these libraries by chance, as we traveled around Wisconsin. But you can find Little Free Libraries, all over the world, from home, just by visiting their interactive map. It pinpoints locations and details, sometimes pictures and links, of most libraries registered with Little Free Libraries. Traveling? Spare yourself, and save some luggage space... you might have a library at your destination, where you can pick up a new-to-you book, and drop it off anywhere you find another Little Free Library. I wish I'd thought of that before we traveled! 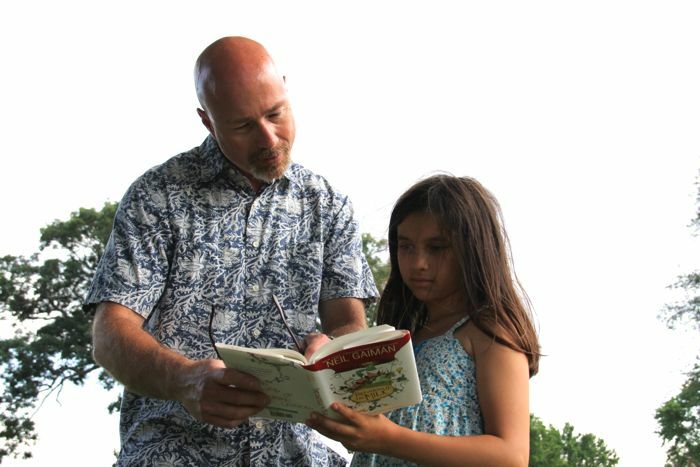 Maria brought her new summer book, Fortunately the Milk, and was eager to share highlights and favorite passages with anyone interested, like her uncle Paul. As we toured around Wisconsin, between destinations, we were all enjoying an audio book, narrated by the author himself, The Graveyard Book, by Neil Gaiman. If you are familiar with The Jungle Book, you may recognize a familiar theme... young child raised outside of his family, in a world wholly unlike anything we know. Wonderful theme, beautifully retold, in a hauntingly delicate, often suspenseful, way. Max has read chapters, aloud, for us, and I will be happy to hear those, again. Neil Gaiman's reading is mesmerizing, and he gives the reader just what you would hope from the author. His inflection, his tone, the authoritative yet gentle, guiding voice giveaway just the right amount of foreshadowing and feeling for the scene, without overstepping, or imposing on the pictures building in your mind. Listening to The Graveyard Book is so compelling, the story so satisfyingly constructed, that sometimes we were sorry to have to park and get out of the car. 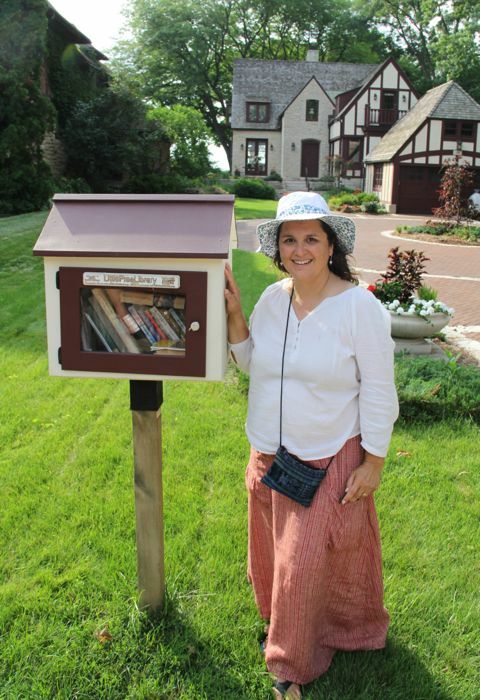 Here is Little Free Library #2785, just west of Tenney Park, on Sherman Street. Wisconsin is covered in Little Free Libraries, which is no surprise, since the first Little Free Library was opened in Hudson, Wisconsin. Tod Bol built a barn red library with a tiny bell tower in 2009, in honor of his mother. Back home, our Little Free Library is getting good use, seeing new books come and go, and making happy neighbors, dogs, too. But don't you agree, we need a bench! 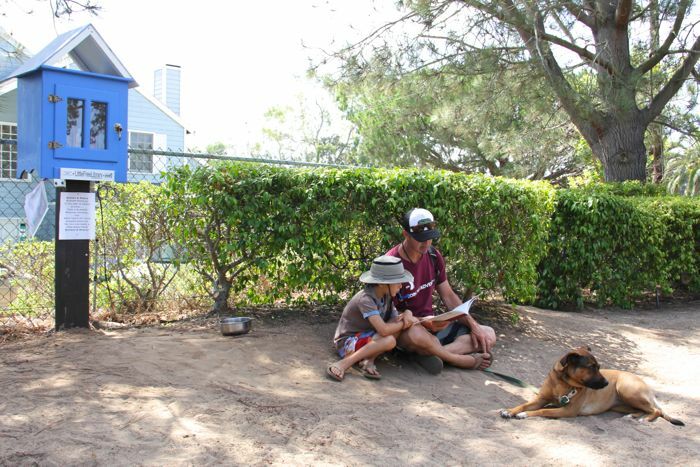 At our library, there's a nice breeze, good shade, we keep a water bowl filled for the four-legged visitors, and you might find lemons or dog biscuits in the library attic. It's pretty sweet, but we have more ideas, more schemes. Maria and I are dreaming up a little craft and bake sale, so we can raise some funds for a sturdy bench, maybe a dog deck, too! Sometimes a book is too compelling to put down, and you just gotta park yourself and enjoy! Absolutely delightful! I love the idea of the little libraries. Your blog is the first time I've ever heard of them. 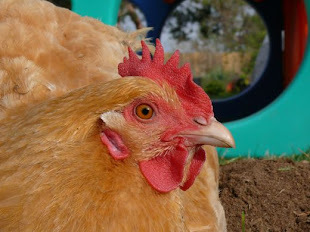 I know, me too! I didn't know they existed until now. And I'm tickled pink to find a Little Free library only 3 miles from my house. I will be dropping off a few books today. This is so unique. And fun. Thank you Natalie.